“Daddy. I can’t remember the shape of his face or how strong his arms are. I forget what he looks like, Mama.” This last bit Brennan says with more than a sigh, this last bit sounds like desperation, like she is reaching out trying to catch the rain and it keeps slipping through her fingers. And my mama heart breaks at the same exact time it cannot- she needs me right now, I can crumble later, just not right now. Deep breath. And I parent my babies for the both of us right now, probably getting it wrong more often than I get it right as I hold their hearts in my own very unsteady hands. It’s a tender thing to walk through, sending your husband to war, and I walk along a razor’s edge at any given moment, always at my limit. Every day, every moment, I find, is a new opportunity to begin again, so I ruthlessly search for the love in the broken and hard places of goodbye, knowing that as I see it myself I can point it out to them, too. The reality is that I’m tired. I miss my husband so much sometimes I can’t breathe. I’m doing the very best I can to hold these three little girls broken hearts while I tend to my own and it’s just such a big job. That’s mothering though, right? Giving them our all even when we have nothing left to give and praying that God fills in the gaps because love is just that big. I’m at a neighbor’s house just as the afternoon is switching over to evening. The girls are playing wild with the neighbors, biking down our street packed to the brim with other military kids. She had invited me inside to share some extra food with me- leftovers from a funeral that hundreds attended, a funeral of a soldier here at Fort Bragg, a funeral of a daddy to four babies of his own and I just can’t even. You maybe saw the video of his heartbroken wife as she mourned his coffin coming home and cried along with the rest of us. My friend’s husband walks in the door, coming back home after attending the service. “Oh, hey Sarah. You guys will never believe the day I’ve had; you have got to listen to this.” And he sits on the stairs, just as Lane does in our own home, and he tells both of us about his day, just as my own husband does, and we laugh because it’s just ridiculous enough to be hilarious and we all need to feel some joy in a day so heavy. I tear up as I watch them interact, laugh at each other, husband and wife but best friends really. I watch him unlace his boots just the exact same way my own soldier husband does and I think how we’re all just the same, really. They’ve moved too, they’ve said the same goodbye’s that Lane and I have said, they have their own babies, he puts on a uniform every morning and comes home to her when he can and they keep taking it one day at a time, the two of them against the world, and we see that the military doesn’t have to drive you apart- it can instead fuse two hearts together. It’s physical when I get home- missing Lane- so I have to go straight up to our closet and get my hands on his clothes; I have to physically feel him when I physically miss him. I bring his freshly laundered clothes to my face and inhale in his scent and his smells and I breathe in deep. Then the babies need me once again so I go back downstairs to change the diaper and pack tomorrow’s lunch and kiss a scraped knee and do bedtime once again- parenting these babies on his behalf while he’s a world away, fighting a war on our nation’s behalf, each of us doing our part. And that’s marriage, right? Come what may, in it together, choosing each other no matter what in the everyday we live side by side or halfway across the world because love is just that big. I’m chatting with her, telling her about my husband’s job, that he is gone a lot, that in fact he is gone for nine months right now, too close to ISIS for my comfort. He assures me he’s fine and I wouldn’t even believe the stories of liberation over there- that our soldiers are cutting down actual literal nooses, actually used on people, from the doorways of Christian churches in Iraq- a very tangible picture of terror turning to freedom, of our good guys fighting away their bad guys. And this time I’m just a little too tired, a little too battle-weary myself to get into it, but had I felt like going there, I would have assured her that I am no stronger than she, I’ve just been dealt a different deck of cards. I would have assured her that I miss my husband after one night too, that I’d rather not do a nine-month deployment, that I battle fear every single day. I would have told her that we just do what we have to do no matter who we are, that there’s only one way through a hard situation and that is just taking it little by little, slowly by slowly, one small day at a time and somehow you learn that you’re strong enough for what you’re given. Sometimes we end up walking roads we didn’t imagine walking, roads that seemed too difficult, roads we weren’t strong enough for prior. The mother of the special needs child, the woman diagnosed with breast cancer, the wife whose husband left her. 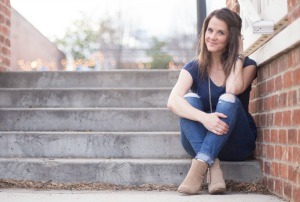 For me, my hard road is a deployed husband in the middle east while I’m here with our three little girls but wouldn’t you know, the strength of God is a real thing. I used to think that military wives were their own unique, tough breed; like the biker chicks of spouse world. A little rough around the edges, bred to handle raising babies without their counterpart in ways other women just aren’t. And then I get to my street- the one that has an on Post address and side by side houses of these military wives. The girls I’ve cried with and drank coffee with and complained with and prayed with and they’re just like the rest of us. In the six weeks since Lane left I have received wine and pajamas and coffee mugs and surprise meals at 4:00pm and chocolate covered strawberries and flowers on Valentine’s Day and pick-me-ups of one sort or another throughout. Should I need someone at 3:00 in the morning, don’t you worry- I have five different numbers I could holler at without thinking twice. This is how we military wives walk these hard roads that we have been asked to walk- we do it together. They carry me as I carry them and that’s community, right? With you and beside you and caring for you and never, not ever alone because that’s just what love does. 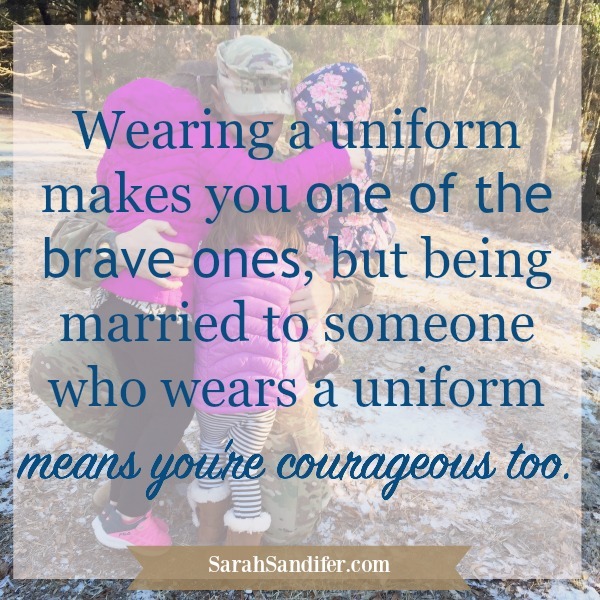 Here’s my point to all of this: Wearing the uniform makes you one of the brave ones, but being married to someone who wears the uniform makes you courageous too. Don’t you forget this. No matter how hard the day or how broken you feel or how not-enough you seem to be, this is the raw beauty of military life. We’re all doing our best and loving our hardest and showing up for our people and somehow because of it all we realize we’re becoming the deepest, most true version of ourselves standing right there next to our soldier. So keep going, Sister. Walk forward on your hard road as I walk mine and we’ll each do our part to bring a little more love to this world than was here yesterday. Because today is a new day and as you ruthlessly search for the love in the broken places you’ll find it and you’ll find something else, this I promise you: You’ll remember that you, indeed, are strong too and you are so beautiful and so powerful because you are your Daddy’s daughter and you got the very best parts of him. In it together, my friend. We got this. Love is so freaking big. Feeling my heart physically ache and fill with pride for our military and my son in law..with every . Single. Word. 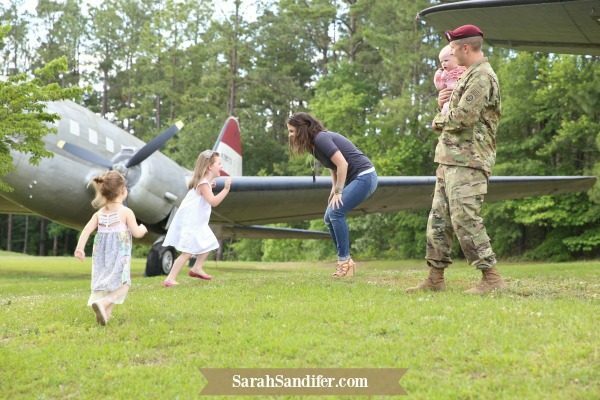 Loved this, Sarah! You have an amazing talent for expressing in words what many of us feel but can’t explain.